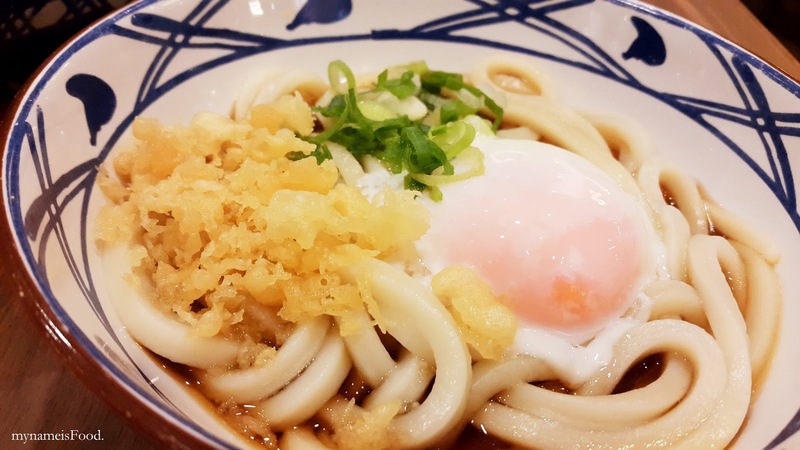 Marugame Udon, Grand Indonesia, Jakarta, Indonesia - my name is Food. What this restaurant reminded me of was Mappen here in Brisbane. So, when we decided to eat here, I was intrigued and was very interested in trying and how it would match with the ones I've tried in Aussie. A very similar concept is used such as the food selection and the way you pick your own Tempura and having free tempura flakes and chopped spring onions available. The only difference was that in Indonesia, since everyone loves their chilli and spicy food (except me that is..), they also have finely chopped red chilli to allow for those spicy eaters to be able to adjust their own spiciness level and add chilli to their own dishes. 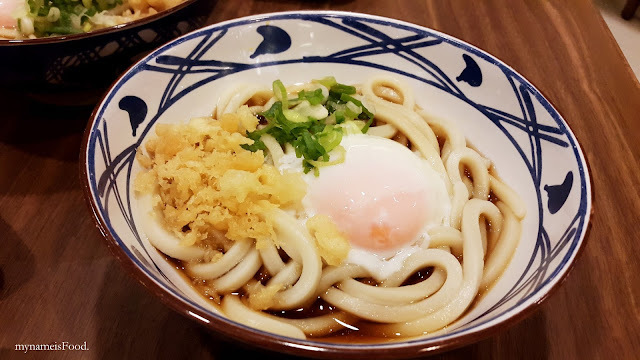 'Ontama Udon' (IDR40k = ~AUD$4) is one of their classic serving their Udon with Bukake Dashi broth with your choice of the broth being warm or cold. It is then topped with spring onions and half boiled egg as well as a scoop of tempura flakes. For those who likes their simplicity, this might just be the right option for you. By being able to crack the egg yolk, it will break beautifully and enhance the flavour of the broth as well as giving that distinct flavour through the Udon noodles. 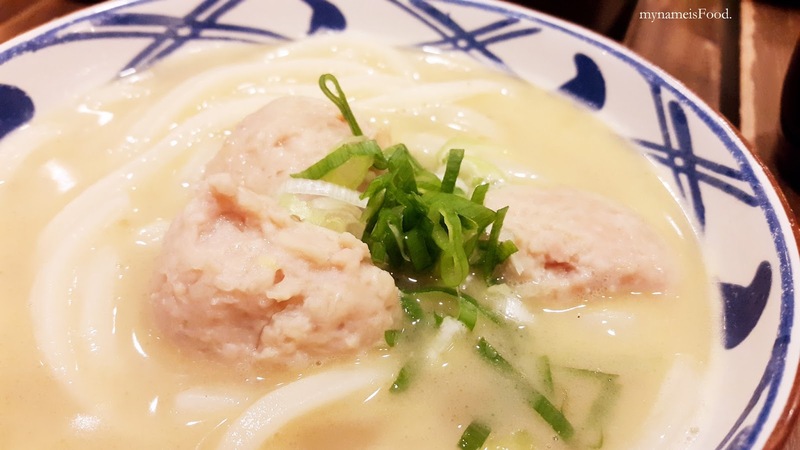 'Tori Baitan Udon' (IDR45k = ~AUD$4.5) is quite different in a way that instead of using Bukake dashi broth or pork broth, it uses Chicken broth which surprisingly was quite thick and creamy which I wasn't expecting. Topped with 3 pieces of chicken meatballs as well as spring onions. These chicken meatballs simply reminded me of Bakso, the traditional Indonesian Meatballs but these were smoother and tender in terms of exterior which means that they used more cornflour or flour to make them. 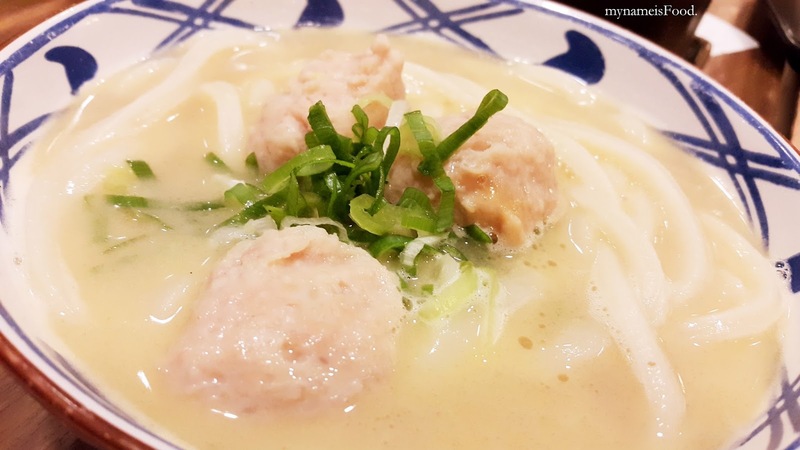 The meatballs itself was flavoursome, working well with the creamy chicken broth. It will suit any chicken lovers definitely. The chicken broth was quite salty but not overly salty but the fact that the chicken meatballs had some sweetness in it, there was balance between the two. 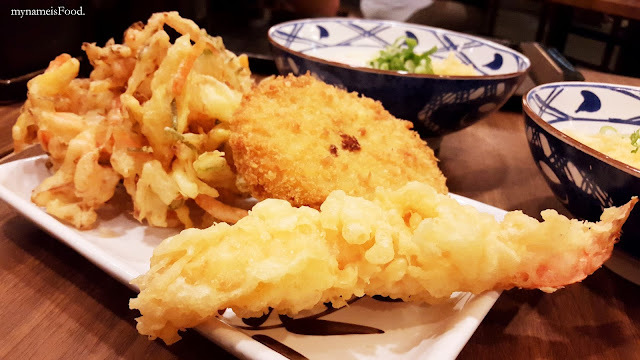 As for the Tempuras, you simply pick the ones you want and place it on your plate and when you are finished choosing what you would like, the person in the counter will simply add up what you have on your plate and add the prices of each Tempura with your Noodle or Rice dish. As for us, we didn't want to order too much as we didn't want to get too full afterwards. With around 10 kinds of different Tempura available, it will suit anyone who wants vegetables or beef or chicken etc. They do differentiate the usual regular Tempura selections with their Premium selections. From L to R as follows; Kakiage, Beef Croquette and Ebi Tempura. 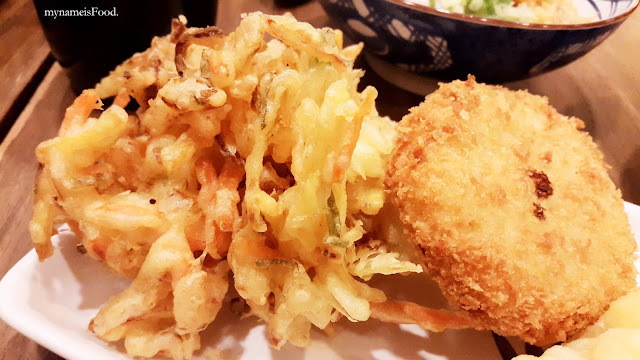 'Kakiage' (IDR11k = ~AUD$1.1) which is a deep fried vegetables tempura shaped into a ball for easy grabbing as well as shaping it into a bunch. Though it can get abit hard when you do try to bite into it. Having a mixture of carrots and onions as well as some greens, it allows you to feel somewhat healthy eating fried food. Don't forget to dip it into your soy sauce dipping sauce. 'Beef Croquette' (IDR12k = ~AUD$1.2) is different than what the usual potato croquette or crab croquette you would get in other Japanese restaurants. This was a croquette filled with beef which I found to be quite delicious as well although it matched better with the original and plain Udon and not too much of the Tori Baitan Udon since that itself already had a strong chicken flavour. The croquette was nicely cooked and was very hot when we grabbed them to our plates. 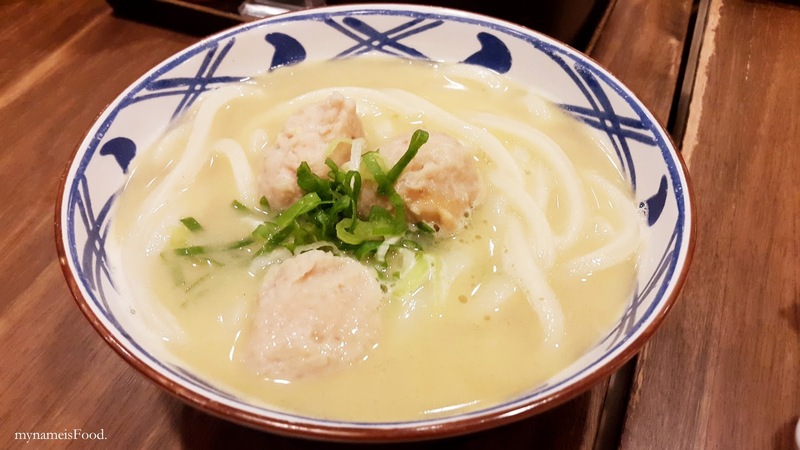 It definitely would suit better with a less thick and less creamier broth udon as it is quite heavy by its own. 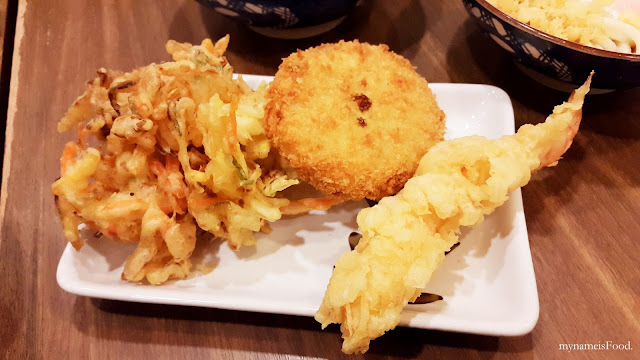 'Ebi Tempura' (IDR15k = ~AUD$1.5) is always something you will be able to find in most Japanese restaurants, if not, all restaurants. The overall taste was okay, just the typical Shrimp Tempura. Again, similar concept with after you have finished eating, you are told to return your used trays to the designated area. I think these kind of self-service restaurants allows diners to have a sense of cleanliness as well as a common sense giving a helping hand to the society. Of course, there will be waiters to clean your table or to wipe any access or mess but then, it is nice to see that maybe the Indonesian community are able to learn a thing or two in regards to etiquette, cleanliness and respecting workers. As most other countries may be very familiar with this concept as an everyday thing, in Indonesia, many are spoilt with the help when it comes to eating or service as it very uncommon for diners to have to take back their used bowls or trays.